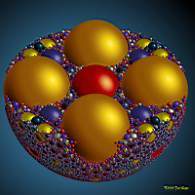 How does one fill a sphere with smaller spheres of various sizes so that every possible void is filled? Sphere inversion transformations are the 3D equivalent of circle inversions. These images use an algorithm that draws touching circles in a strip that stretches to infinity. 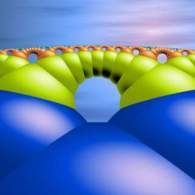 In some images this infinite strip was inverted into one circle.The algorithm is based on a paper by Professor Hans Herrmann of Stuttgart University, Germany. 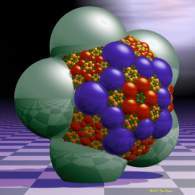 More arrangements of spheres obtained by 3D inversion.